In the 1840s a large block of ice was displayed in a shop window on the Strand in London. This was an amazing site and people crowded to get a glimpse of it. By the end of the century ice was much more common and it could be found in people’s homes being used to chill and preserve food. Ice was stored in cities in deep wells where it could be stored for months until it was needed in the summer. The ice was delivered to customer’s doors by a horse and cart every day and small blocks would be chiselled off by the delivery man. 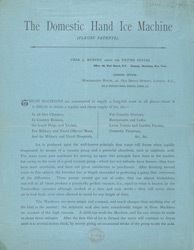 A device like Fleuss’ ice making machine would have been very attractive for wealthy Victorians.